The dome topped case has a brass carrying handle, elaborate side frets, front corner decoration and a fine arch fret. This case sits on a turntable base allowing the case to be turned round for winding. The heavily constructed 8-day movement has 6 turned pillars, anchor escapement and chimes the ¼`s on 8 bells and the hours on one. 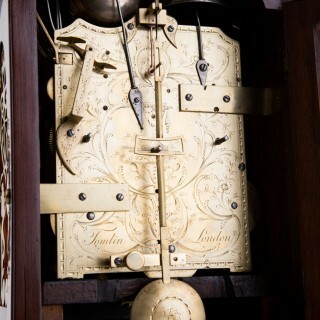 It has an urn and floral engraved backplate, fully signed, a pendulum holdfast and it retains its original key. 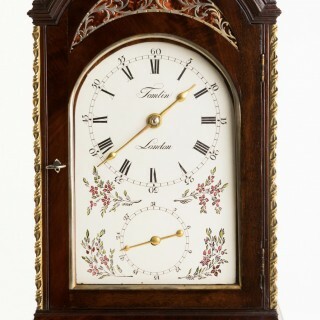 The 10” x7” arched dial has floral and foliage decoration, a date ring, 3 brass hands and is fully signed. Edward Tomlin, London was working in Bartholemew Lane and the Royal Exchange from 1768 – 98. 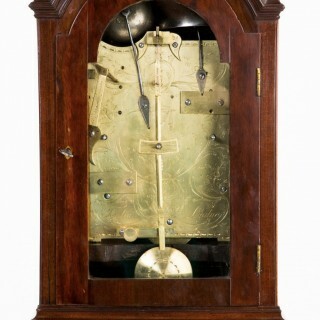 A well-known maker of chiming and musical clocks. 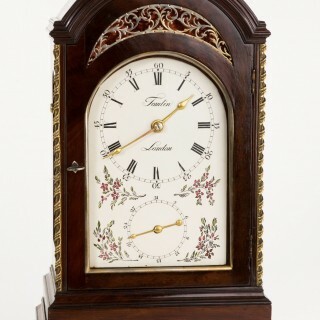 A fine unusual mahogany 8 bell ¼ chiming clock by Tomlin, London C1770 with back winding and turntable base.